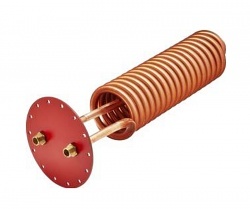 LK45 coil will fit all Akvaterm & Jaspi accumulators of 1000L or larger. This is an upgraded finned copper coil / heat exchanger for domestic hot water or indirect heat sources like heat pumps, wood burners or solar systems. Pipe connection is 3/4" (22mm) and the coil length is 950mm. Diameter 170mm. LK45 is delivered with a tank flange and a gasket.